Precipitation that has accumulated within the last 24 hours. Precipitation that has accumulated within the last 7 days. The Daily Precipitation map shows the amount of precipitation that has accumulated within the last 24 hours. 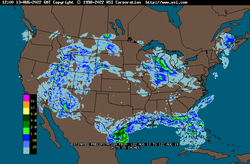 The precipitation imagery displays precipitation estimates in colorized contoured bands by interpreting the intensity levels of NOWrad mosaic radar into rainfall estimates each hour. These daily summaries provide a cumulative precipitation estimate from 1200GMT yesterday to 1200 GMT (daily) or 1200 GMT 7 days ago to 1200 GMT today (weekly). Rainfall is typically measured using a rain gauge. It is expressed as the depth of water that collects on a flat surface, and is routinely measured with an accuracy up to 0.1 mm or 0.01 in. Rain gauges are usually placed at a uniform height above the ground, which may vary depending on the country. There are two types of gauges. Storage rain gauges are used to make daily or monthly measurements. Recording rain gauges measure the intensity of rainfall using a tipping bucket which will only tip when a certain volume of water is in it. An electrical switch can be used to record the tips.